Senate Majority Leader Mitch McConnell warned Democrats of the perils of “presidential harassment” Wednesday, saying efforts to obtain President Donald Trump’s tax returns and conduct oversight of his administration would backfire politically. 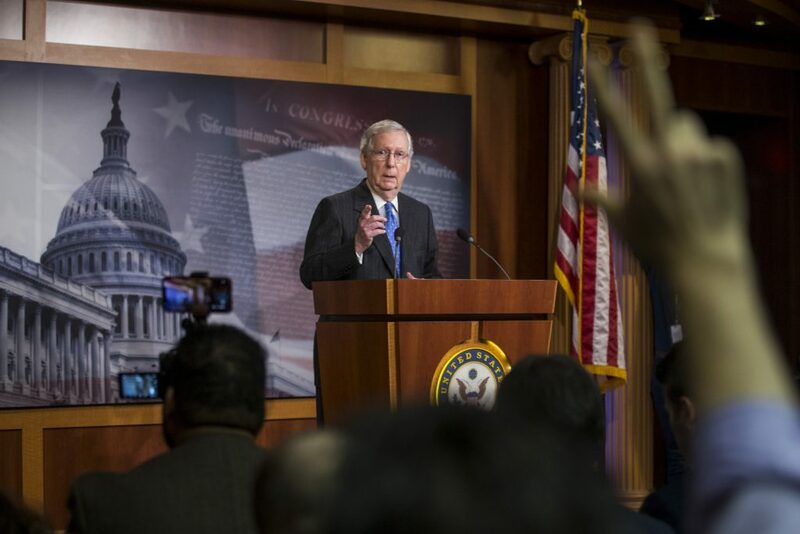 In his first remarks since the election, McConnell praised Trump after a mixed night for Republicans in which they ousted Democratic incumbents in Republican states, adding to their Senate majority — but lost control of the House. McConnell (R-Ky.), said the results were a clear vote for bipartisan cooperation and predicted that the American public would not tolerate efforts to target the Trump administration with subpoenas, investigations and lawsuits over the next two years. McConnell drew on the example of the 1998 midterms, which came shortly after Republicans had begun impeachment proceedings against then-President Bill Clinton and saw the party focus heavily on his morality and fitness for office. The party lost four seats, prompting the resignation of then-Republican Majority Leader Newt Gingrich. House Minority Leader Nancy Pelosi (D-Calif.) said Democrats “have a responsibility for oversight” as part of the nation’s system of checks and balances. “I don’t think you’ll have any scattershot freelancing in terms of this,” she told reporters at a Capitol Hill news conference. McConnell said he would defend Trump’s agenda when possible, but acknowledged that the election meant some of Trump’s signature promises, including securing the money for a U.S.-Mexico border wall and repealing the Affordable Care Act, would now be difficult to achieve. He vowed to work with Pelosi on urgent issues such as health-care and infrastructure. “The message is, figure out what you can do together and do it,” he said. Last night’s results marked a personal triumph for McConnell and his backing of strong pro-Trump candidates in states the president won: The GOP flipped seats in Missouri, North Dakota and Indiana, won closely fought races in Tennessee and Texas — and appeared on the brink of victory in Arizona and Florida. The only loss of a GOP seat was Nevada, where Rep. Jacky Rosen defeated Sen. Dean Heller. The results will allow McConnell to resume his long-term mission of reshaping the federal judiciary, with Senate Republicans no longer restrained by a wafer-thin 51-49 majority on federal appointments. That will change McConnell’s calculus for future judicial appointees, with the support of moderate senators such as Lisa Murkowski (R-Alaska) or Susan Collins (R-Maine) no longer needed. The Kentucky Republican often describes himself as working in the “personnel business” and has relished the opportunity to confirm judges since Trump’s election, installing two justices on the Supreme Court, 29 appeals court judges and 84 judges overall. By the same point in Barack Obama’s presidency, Senate Democrats under the stewardship of Majority Leader Harry Reid had confirmed 11 appeals court judges. McConnell made clear that with Republicans losing the House and limited capacity to pass legislation, working with Trump to confirm conservative judges was one of the few strategies he could pursue and that it would remain his primary goal. Justice Brett Kavanaugh’s confirmation means a conservative majority already exists on the Supreme Court, which could hear pivotal cases on campaign finance and presidential powers over next two years. GOP control of the Senate opens the door to the possibility of a third Supreme Court justice before the 2020 election, although the oldest serving justice, Ruth Bader Ginsberg, 85, says she has no desire to retire. His remarks affirmed the productive partnership that McConnell has forged with Trump over the past year — one which proved fruitful as he masterminded a strategy to retain Republican rule in the upper chamber. With Trump campaigning in the states in the campaign’s final weeks, McConnell was able to fire up the Republican base and boost turnout in contests where the judiciary is often an issue. With McConnell’s support, Trump focused doggedly on Kavanaugh, criticizing Democrats’ treatment of the nominee, who faced allegations of misconduct. Kavanaugh denied the claims. McConnell pointed out that the only red-state Democrat who survived Tuesday was Sen. Joe Manchin of West Virginia, who voted for Kavanaugh. Democratic Sens. Heidi Heitkamp of North Dakota, Joe Donnelly of Indiana and Claire McCaskill of Missouri voted against the justice and lost their reelection bids. Another no vote, Sen. Jon Tester of Montana, eked out a win.